Louie: Mark my words, Mittens. One day, someone's gonna stand up to you! Someone's gonna teach you a lesson! Bolt: You know why I'm here! Vinnie: Come on, Mittens. Just tell the guy where she is. Tell the dog, make him happy. Bobby: Yeah, yeah, come on, Mittens! Tell him! Mittens: [chuckles briefly] Joey, Vinnie, Bobby, my boys! Would you tell the crazy canine that he's got the wrong cat? Vinnie: [pause] You got her, pal! Joey: That is definitely the right cat! Mittens: Whoa! Aaah! You're crazy, man! Vinnie: Hey Joey, did we go to far on this? Rhino: Okay, here’s the thing. You’re not ready for the evil laugh. Dachshund: Oh. I-I'm sorry. You wanna sniff mine first? Mittens: I don't know what's going on here, but I'm just a little bit concerned about the number of lunatics on this trip. My limit is one. Rhino: They need a hero Bolt, someone who, no matter what the odds, will do what's right. They need a hero to tell them that sometimes the impossible can become possible if you're awesome! Bolt: [trapped] I can not be contained in any container! Thug: I'm not talking to you. Thug: [shouting] Bolivia! Bolivia! Calico's in Bolivia! Near Lake Rogaguado! Penny: Lake Rogaguado. I should've known. Penny: [after taking Polaroid self-portraits of herself and Bolt] That's a keeper! Rhino: [to the guard outside of the studio] I'm going to beat your pancreas with your spleen! Penny: Yeah, you're my good boy. Mittens: [now looking very obese] Hey! Look! My stomach's distended! How great is that? Bolt: [about saving Mittens] I can't do it. Rhino: [shocked] Wha... What did you say? Rhino: What... Wha... wha... Who are you? Bolt: Rhino, you just... just don't understand. Rhino: Who singlehandedly destroyed the Green-Eyed Man's undersea labs? Rhino: Yeah! And who foiled his plan to infiltrate the Olympics with gymnastics cyborgs? Who, Bolt, who? Who? Rhino: You! You CAN, Bolt, because all over this planet, there are animals who feel like they can't. Like a little hamster who once spent his days in an RV park, dreaming of the day when he, too, would save a little girl from danger and be told: "You did it. You did it, Rhino! You saved the day." They need a hero, Bolt! Someone who, no matter what the odds, will do what's right. They need a hero to tell them that sometimes the impossible can become possible... if... you're... awesome! Bolt: Well, you're right about one thing, Rhino. Mittens does need a hero, and I guess I'll have to do. Rhino: Such modesty! Now, who's going to save the cat? Rhino: Who? Tell me who! Rhino: [laughs delighted] I'll get my ball. Penny: [after taking photographs with Bolt] That's a keeper! Rhino: [running, catching up to Bolt] I'm on your six. Rhino: Yeah, and Bolt's pictures are the best! Bolt: She was kidnapped by the Green-Eyed Man. Bolt: Grave danger, I know. But I've captured this cat. Rhino: An agent of the Green-Eyed Man, I presume? Bolt: Oh, you presume correctly. She's taking me to Penny. Rhino: You - you are vile vermin! How do you sleep at night? Penny is most wonderful person ever, and she loves Bolt, and he's awesome, and you're a monster! How dare you disrupt their relationship with your evil? Bolt: [Restraining him] Whoa, whoa, whoa, whoa! Rhino: I can take her, Bolty! Let me at them! Die! Die! Mittens: Go on, use the dog face. This is gonna be beautiful. Mittens: Do the dog face! Bolt: What? The dog face? What does that mean? Mittens: [sighs] Figures, I'm tied to the one dog on Earth who doesn't know how to beg. 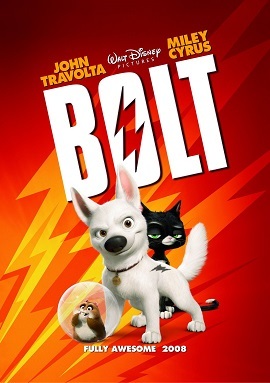 Bolt: Okay, guys, but I really gotta get going. Blake: I know, I know you're a busy dog, but if you've got a second, we'd love to pitch you an idea for your show. Tom's better pitching, I'll let him take it from here. Tommy's got the spotlight! Tom: It'll be huge, man. Huge. Blake: You can't touch us! Bolt: Uhh... I - I love it. But I'll tell you what. If you guys can help me find Penny, that girl from the television show, well, I'd love to hear more about this aliens idea, but on the way. Blake: We got a nibble! Tom: Don't freak out. This is how you blew it with Nemo. Mittens: Excuse me? That wasn't the deal! We had a deal! Louie: She said that to me not ten minutes ago. The irony! Bolt: But what do dogs do? Mittens: Slobber, sleep, chase tails, chew shoes... You don't exactly need a master's degree. Rhino: I'll get a ladder. Rhino: I'm lightning quick, I have razor-sharp reflexes. Wha! And I'm a master of stealth. Rhino: Plus, I'll keep the cat in check. Bolt: [Gets down close to Rhino's ball] The road'll be rough. Rhino: [indicates] I have a ball. Bolt: There's no turnin' back. Rhino: Guess I'll have to "roll" with the punches! Rhino: [getting closer] I eat danger for breakfast! Mittens: [referring to the animal shelter they're being taken to] They always pick the cute ones, the ones that look like you Bolt, but the rest of us never come back out. Young Penny: [points to puppy Bolt, decisively] That one. Pigeon 1: [after seeing Bolt and Penny go out to play] Does that dog look familiar? Pigeon 2: Nope. Never seen him before in my life. Jenny Lewis: [singing] # There is no home like the one you've got / Cause that home belongs to you. Rhino: [after seeing UFOs in an episode of "Bolt"] That is totally unrealistic. Bolt: Okay. So what we do here is we give the target a quick flyover, we adjust the trajectory, and then land dead center. Am I missing anything, Rhino? Rhino: Just the knowledge that every minute spent in your company becomes the new greatest minute of my life! Penny: [after they finish filming] You saved me again, Bolt. Ester: [after seeing her truck explode] Sweet Sister Francis! What did you do to my new truck? Rhino: [with upset stomach] That meat lover's pizza is NOT loving me back at all! Bolt: [Bolt and Rhino have gone searching for Mittens in an Animal Shelter. Bolt locates her in a cage in the back] Mittens? Mittens: [turns around] Bolt? Wh... Wha, what are you doing here? Bolt: I'm busting you out. Mittens: You - You came all the way back here... for me? Mittens: But how'd you...? I mean... You don't have any superpowers! Bolt: It's been a lot, yes, it has. Bolt: Are you ready for this? Martin: [after Ester pepper-sprays him] Spicy eyes! Bolt: What is this red liquid coming from my paw? Mittens: It's called blood, hero! Mittens: Yes, so if you want to keep it inside your body, where it belongs, you should stop jumping off trucks doing eighty on the interstate! Mittens: [to Bolt] The real world hurts, doesn't it? But you wouldn't know anything about that, would you? Mittens: [about people] They pretend they're going to always be there for you, and then one day they pack up and move away and take their love with them, and leave their declawed cat to fend for herself! They leave her, wondering what she did wrong. Vinnie: You know, I gotta say something, if I could say something here. You look familiar. Joey, look at this guy's mug. Vinnie: I gotta tell ya, I never forget a face. Bobby: Yeah, yeah. He's really good with the faces and such. Bolt: Listen, listen! The man with the green eye. Tell me what you know, birds! Vinnie: [pause] I know this dog. Bobby: Yeah, yeah, me too! Vinnie: I gotta remember, it's gonna kill me. Hold on. Vinnie: [pause] No, I don't know. I, I, I thought I know. Bobby: Hey, you ever hang out down on 14th Street with a stray named Kelvin? Joey: Yeah, yeah, yeah, yeah. Kelvin, the Labrador. Vinnie: You gotta gimme something here, cause this is redonkulous. Vinnie: Capisch redonkulous! Ya know what that means? Rhino: If Bolt's taught me anything, it's that you never abandon a friend at a time of need! [starts rolling down the alley] Rhino: When your teammate's in trouble, you go! Not caring what dangers you may face, you go! Not knowing if you're coming back dead or alive... [rolls out of sight] Mittens: He went the other way. Rhino: [rolls back] You go! Knowing how deeply the shrapnel's going to pierce your hide, you go...! The Director: [Checking the latest film for errors] Boom mike! Crewman 1: Got a boom mike. Crewman 2: That's a boom mike. The Director: That's sloppy. The dog could've seen that. He could've seen that! Mindy: Uh, who cares if the dog sees a boom mike? The Director: Forgive me for answering a question with a question, but- who are you? The Director: Of course. Let me ask you, Mindy From The Network, what do you see here? The Director: "The dog" she says. Oh, Mindy. Poor, poor Mindy. Mindy: Am I- missing something? The Director: You're missing everything, Mindy. You see a dog. I see an animal that believes with every fiber of his being, every fiber... that the girl he loves is in mortal danger. I see a depth of emotion on the face of that canine the likes of which has never been captured on screen before. Never, Mindy From The Network. We jump through hoops to make sure Bolt believes everything is real. It's why we don't miss marks. It's why we don't reshoot. The Director: And it's why we most certainly do not let the dog see boom mikes! The Director: Because, Mindy From The Network, if the dog believes it, the audience believes it. Mindy: [Unimpressed] Wow. Okay, you want reality, here you go chief. The show's too predictable. The girl's in danger, the dog saves her from the creepy English guy, we get it. There's always a happy ending. And our focus groups tell us 18 to 35 year olds are unhappy. They're not happy with happy. So maybe you should, I don't know, spend a little less time worrying about the dog's method acting, and more time figuring out how to stop 20 year olds in Topeka from changing the channel. Because if you lose so much as half a rating point, so help me, I will fire everyone in this room, starting with you! How's that for real? Mittens: Louie, what is this? Louie: It was a slow week. I mean, that's half of what I got. Mittens: You hear this, Louie? I'm starving here. And when the old stomach starts talking, it's not talking to me. It's talking to... the claws! Louie: Not the claws! Please! Mittens: I'm holding these bad boys back as best as I can, but the thing is it's not up to me. The stomach's got a direct line to these babies, and I'm picking up a lot of chatter! So, I'll talk to the claws, but in exchange, next week, all your food comes to me. Louie: But that's not our deal! I bring you half, you give me protection! That's our deal. Mittens: Yeah, well, the deal just expired. Now, get lost. Mittens: Listen Cujo, I got some pretty wicked claws under these mitts, do not, I beg of you do not make me bring out these bad boys! It gets ugly! Mittens: [Bolt is leaving the studio lot after witnessing his owner working with another dog due to his absence] Hey Wags! Bolt: Mittens? What are you doing here? Mittens: Eh, long story short I was tied to a delusional dog and dragged across the country, but that is not important. Now the real question is, what are you doing here and why aren't you in there? Mittens: No Bolt it is real, I was in there just now, I saw her face after you left. She's brokenhearted, she doesn't want just any dog, she loves you. She's your person, Bolt, and you are her dog. Rhino: [singing] There's no truck that I know that can keep in Bolt and Rhino! Bolt: Ah! What is that? Bolt: [stomach growls again] That! Okay, you have two seconds to tell me what you've implanted in me, cat! Poison? A parasite? Poison? Wait, I just said that, didn't I? See, I'm all discombobulated! I can't think straight! Mittens: [in disgust] Oh, I don't believe this. You're hungry! Bolt: [jumps on Mittens] Where is the antidote? Mittens: There's your antidote: food. Rhino: Let it begin! Let it begin! Let it begin! Rhino: All my training has prepared me for this moment. Mittens: How do you say "No way I'm doing this" in crazy? Mittens: Look, genius, you're part of a TV show. You know what that is, television? It's entertainment for people. It's fake! Nothing you think is real is real! Mittens: Think about it, Bolt. Since you got lost, none of your superpowers are working, are they? For the first time, you're hungry, you're bleeding... I mean, do you really think that you were born with a birthmark in the exact shape of a lighting Bolt? Mittens: It's the mark of a makeup artist, dog! Bolt: You're ridiculous! Now get down here. Bolt: You leave me no choice. Rhino: Rhino is awesome! He's so awesome! He's... He's beyond awesome! He's... be-awesome! Rhino: ["holding up" his ball] It's a good day to die! Mittens: [plucks him out] Not on my watch, rodent! Bolt: [Looks around corner into an office at the animal shelter] There's a guard. Rhino: [Starts walking into room] I'll snap his neck.